• The original Certificate is printed on certified paper. • The original Certificate has a wax seal. This seal is a stamp that guarantees the authenticity of this physical document. • The original Certificate has been signed at our factory. • The original Certificate has a unique production / order number. • The original Certificate number, can be traced back to the craftsman. • The original Certificate is inextricably linked to the warranty terms. • The original Certificate entitles the transferable warranty upon re-sale. 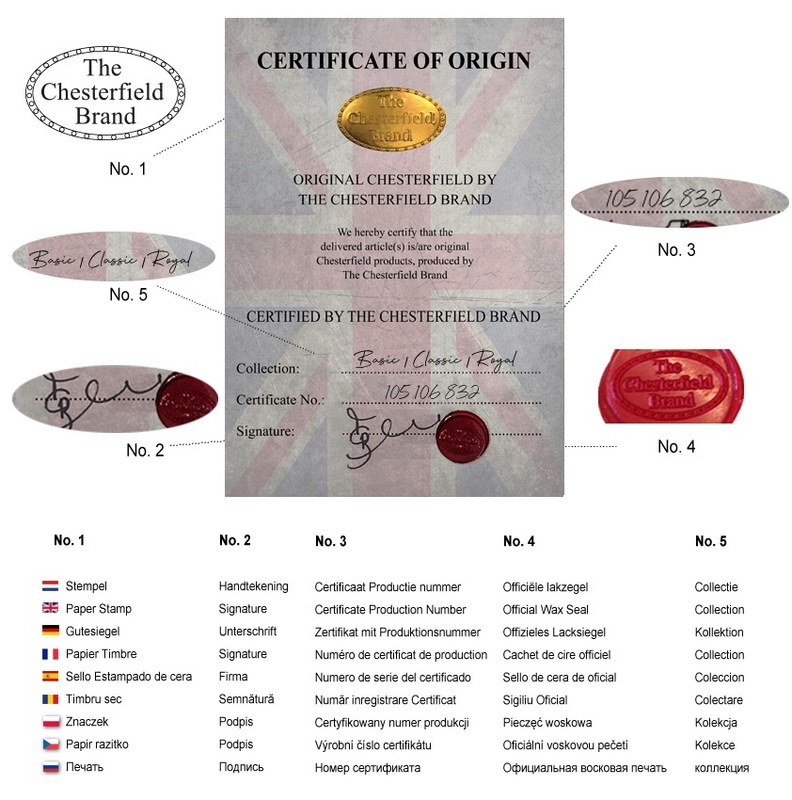 Only furniture of The Chesterfield Brand come with an original numbered Certificate of Authenticity. On top of that, every individual piece of furniture will be labeled with the logo of The Chesterfield Brand. The furniture is produced in an authentic way. The furniture is an original piece of "The Chesterfield Brand" furniture. The furniture is produced, shipped and transported with great care. This certificate shows you that we are proud of our brand and our quality. We want to emphasize this with providing you this certificate. As we see it, it is our duty that everyone in the whole world can enjoy this timeless and beautiful furniture we deliver worldwide. That means that we really deliver to every country regardless of how near or far away it is.